Communication is important while traveling abroad. Whether it is staying in touch with friends and family back home or keeping in contact with travel partners, you need a way to stay connected. The problem is most of our cell phone plans don’t cover texting outside our home country. When it is available it comes at a high price. Luckily, there are ways to text for free when you are abroad. As I mentioned in How To Use Your iPhone for Free Abroad, WiFi is king. With WiFi you can basically do anything for free which include texting. However, you can’t use your traditional texting apps to do this. Texting from your smartphone in another country means you will pay to send and receive texts messages if you send a traditional SMS. Luckily, there are free ways to send texts using WiFi. When you have a WiFi connection you will not be using your data plan and all data will be sent and received over WiFi. However, you must use texting and messaging apps to do this. 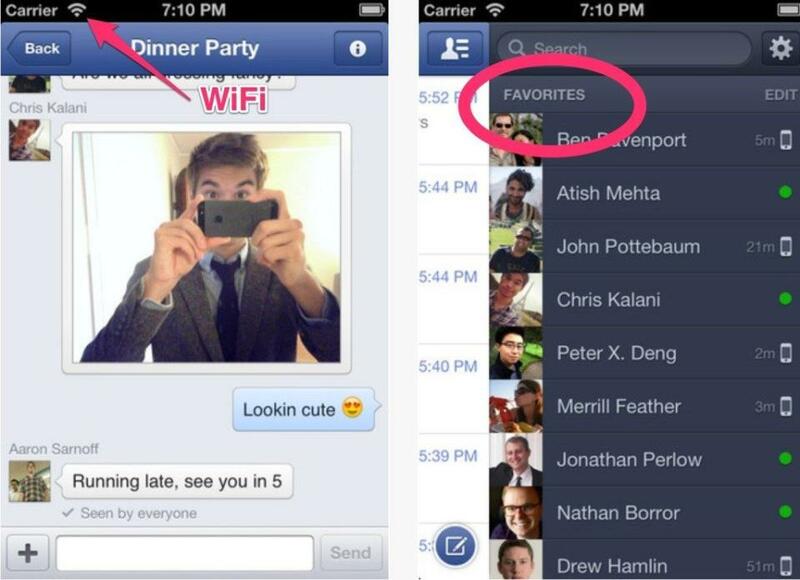 There are a number of great apps for texting and messaging over WiFi. This messaging service is built right into your iPhone. When you are texting another person with an iPhone or iDevice the messages that are sent are 100% free. Be sure to be connected to WiFi and that the recipient has an iPhone. For a detailed description on using iMessage head over to this post which goes into detail. We don’t all have an iPhone and we don’t need to. The debate over Android devices and iPhones is for another day and luckily it doesn’t matter which you prefer. There are great messaging apps for both types of phones. I am a WhatsApp user and have been for a long time. WhatsApp allows you to send free messages anywhere in the world over a data connection. What this means is when you are abroad you must have a WiFi connection to use it without being charged. When it is not connected to WiFi is uses your data plan which means it will not be cheap if you are traveling on your mobile plan based at home. WhatsApp allows you send messages to anyone who has the app. It is available for just about any smart phone and only $0.99. Tell your friends and family to download it before you leave and stay in contact whenever you have a WiFi connection. Facebook messenger is another simple solution. Not only is it free but you will already have access to all of your facebook friends as contacts. This is different than sending a message through facebook but basically serves the same purpose as a texting and messaging app. Instantly reach your friends and let them reach you by activating push notifications. It doesn’t matter if your friends are on facebook at the time or not. It will send a notification directly to their phone using the app. It is a simple app and another favorite of mine. Texting home is just like texting within the country you are traveling. You will need WiFi connections to text and message your friends or family. Just follow the steps above to text to your home country while traveling abroad. Have an iPhone? Learn how to call home for free too. So you just got home from traveling and you made some friends abroad but how do you stay in touch? Well besides email and Skype you can still text anyone abroad for free using third party apps. The key to remember at home is you DO NOT need a WiFi connection to text abroad. Why is this the case? When you are at home you already have a data plan with your smart phone. This means you can avoid expensive international texts by using the same apps listed above. The benefit of texting from home you only need your regular cell phone plan and you do not need to be connected to WiFi. There is no problem with using WiFi but it is not necessary. Sending a text through WhatsApp or Facebook Messenger would be just the same as sending an instant message if you were on your laptop. You are using an internet connection to send the message. In this case, with your smartphone, you are using your data plan that you already pay for at home for regular use. Sending messages through these apps will have no extra charge as long as you already pay for a data plan at home. If you have a smart phone you probably have a large data plan. This means you can text your friends from home using third party texting and messenging apps. My favorites are WhatsApp and Facebook Messenger but there are dozens available. Due to the fact both parties need the app, using a popular app makes life easier. It increases the chances that a lot of your contacts have already installed the app on their phone. WiFi is almost everywhere these days. We can find it in remote hostels, cafes, and airplanes. However, what do we do when we need to text without a WiFi connection? You can buy a prepaid package from your mobile carrier before you leave the country. For example, AT&T will allow you to purchase 50 global text messages for $10 per month. You can add this to your plan before you leave and remove it when you get home. If you send 50 texts it will be a lot cheaper prepaying the $10 than paying the international texting rates. This is handy for traditional texts and there are no third party apps required. International data packages are expensive for most carriers. Using AT&T as an example again, you are looking at $30 for only 120MB. That is not much for emailing or browsing the web but that is enough to a lot of messages using WhatsApp. If you prefer, you can use an app that uses data to send and receive messages. Be sure to pre-purchase data from your carrier before you leave for your trip. WhatsApp has a handy built-in Usage Calculator in the settings. This allows you to monitor all of the data you have sent and received. 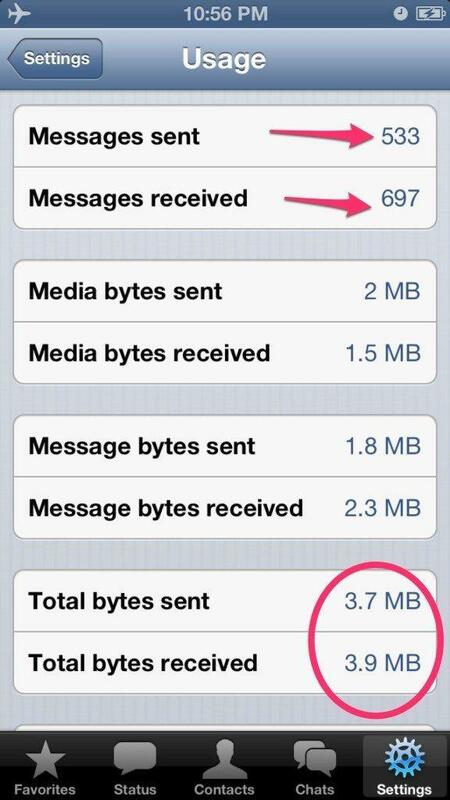 As you can see, since I last cleared my statistics, I have sent and received 1,267 messages using WhatsApp which used 7.6 MB of data. That is not very much data and it is a lot of messages. So if you were to purchase 120 MB you will be able to send thousands of messages using the App with your pre-paid purchase. For some, this may be the best option and is one I use often. There is always a way to stay connected for free when you are traveling. If you can cut back on the texting and only text when you have WiFi then it will always be free. If you must text without WiFi, pre-purchase an international data plan before you leave. Exclusive Travel Hacking Tips Delivered to Your Inbox Weekly!